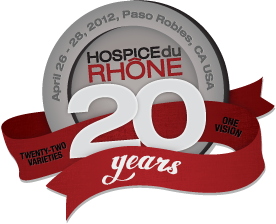 Twenty Years of Hospice du Rhône in 2012! Mark your calendar for the 20th gathering of the Hospice du Rhône wine event taking place April 26-28, 2012 in Paso Robles, California. For the past 20 years, three-days in the late spring have been reserved for an exclusive weekend surrounding all things Rhône. A palate provoking weekend embracing the enchantment, history and tastes of the Twenty-two Rhône varieties. Throughout the weekend, tip your glass with worldly Rhône wine producers, journey through the largest international collection of Rhône variety wines and savor Rhône exceptional cuisine all while taking in the inspiring and spirited Rhône community. Passes for the 20th year are currently available for purchase on our order page. All event questions should be directed to Hospice du Rhône.